Henry Ford transformed America by creating “a motor car for the great multitude.” Always interested in tinkering with machinery than in working on his parents’ Dearborn farm. Ford gravitated toward the young auto industry in the 1890’s. The Model T, introduced in 1908, was reasonably priced, simple to operate and easy to maintain. Tremendous demand for the car led Ford to make production changes resulting in the moving assembly line. The $5-a-day wage he offered in 1914 was equally unprecedented. Ford created the Henry Ford Museum and Greenfield Village to preserve our American experience and heritage. Marker series. 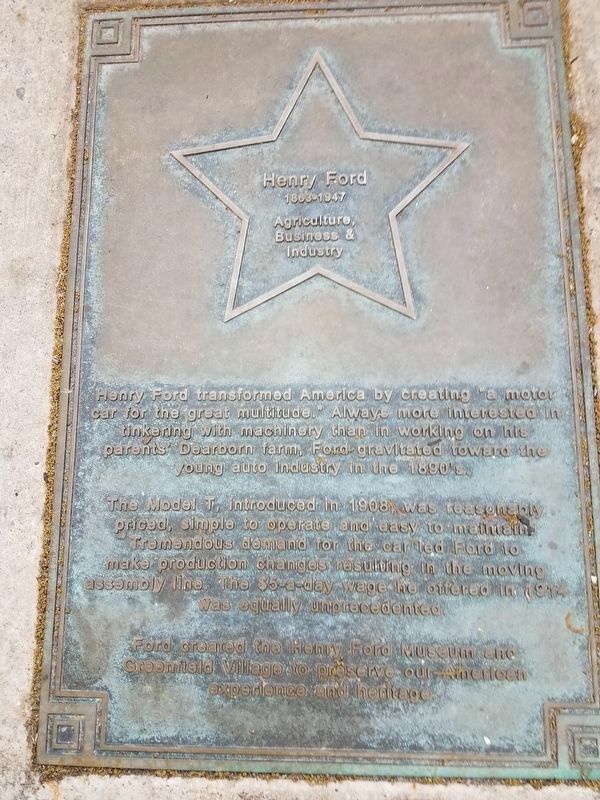 This marker is included in the Michigan Walk of Fame marker series. Location. 42° 43.774′ N, 84° 33.131′ W. Marker is in Lansing, Michigan, in Ingham County. Marker can be reached from South Washington Square, on the right when traveling south. Touch for map. Marker is at or near this postal address: 404 South Washington Square, Lansing MI 48933, United States of America. Touch for directions. Other nearby markers. At least 8 other markers are within walking distance of this marker. Thomas Edison 1847-1931 (about 500 feet away, measured in a direct line); E. Genevieve Gillette 1898-1986 (about 500 feet away); Ernie Harwell b. 1918 (about 800 feet away); Rosa Parks 1913-2005 (approx. 0.2 miles away); Ransom Eli Olds Breakthrough (approx. 0.2 miles away); Jeff Daniels b. 1955 (approx. 0.2 miles away); Theater District / The Strand (approx. 0.2 miles away); State Bar of Michigan (approx. 0.2 miles away). Touch for a list and map of all markers in Lansing. More. Search the internet for Henry Ford 1863-1947. Credits. This page was last revised on June 16, 2017. This page originally submitted on June 7, 2017, by Bill Rieske of Lansing, Michigan. This page has been viewed 107 times since then and 8 times this year. Photo 1. submitted on June 8, 2017, by Bill Rieske of Lansing, Michigan. • Bill Pfingsten was the editor who published this page.